As some of you might know, we have begun two years ago to landscape with native plants around the Creekhouse in Harlemville. We had been motivated to do this by the beauty of the native plants we have gotten to know during our inventories in their wild habitats, by witnessing the ecological impact of invasive plants that have escaped from ornamental gardens, and also by books like “Bringing Nature Home” (Doug Tallamy, 2007) and “Noah’s Garden: Restoring the ecology of our own backyards” (Sara Stein, 1993). We thought, we were part of a rather new “gardening with native plants” movement. However, last week, I realized how old this tradition of gardening with natives really is. Conrad gave me a copy of the book “American Plants for American Gardens” by Edith A. Roberts, Professor of Botany at Vassar College, and Elsa Rehmann, Landscape Architect. It had been published in 1929!!! 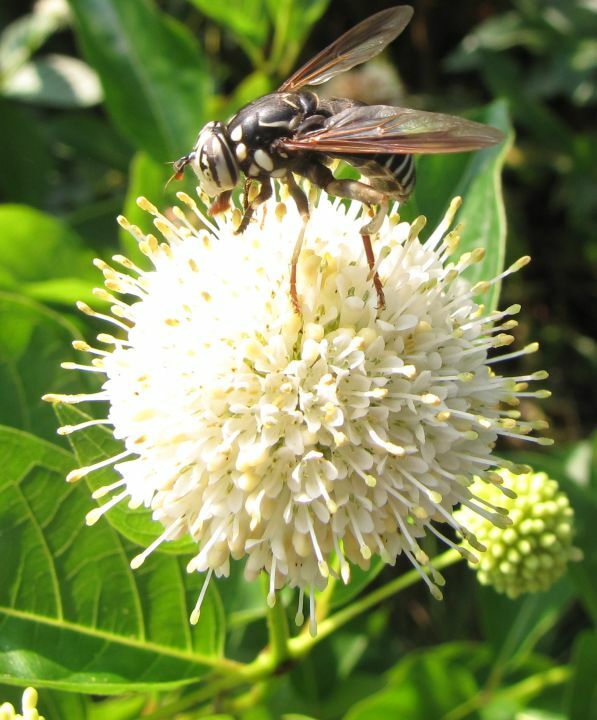 In this blog, I will share with you some images of native plants we have invited into the landscape around the Creekhouse. 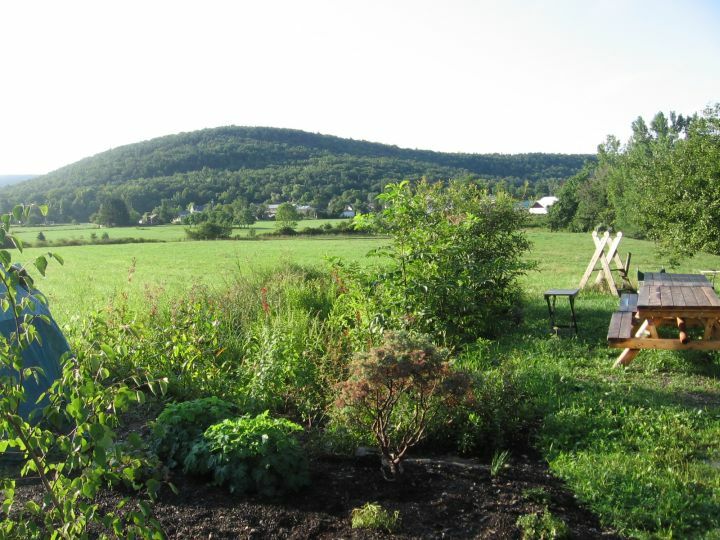 Some of these native plants grow in traditional garden beds that were started “from scratch” either by smothering existing vegetation with newspapers and mulch (e.g., the Roadside Garden and the Shade Garden) or by digging holes and then filling them with topsoil brought in from other places on the farm (e.g., the Rain Garden and the Welcome Garden). Other native plants continue to grow right where we found them and we are slowly working on giving them more and more space by removing non-native competitors (e.g., the South and West Slope). 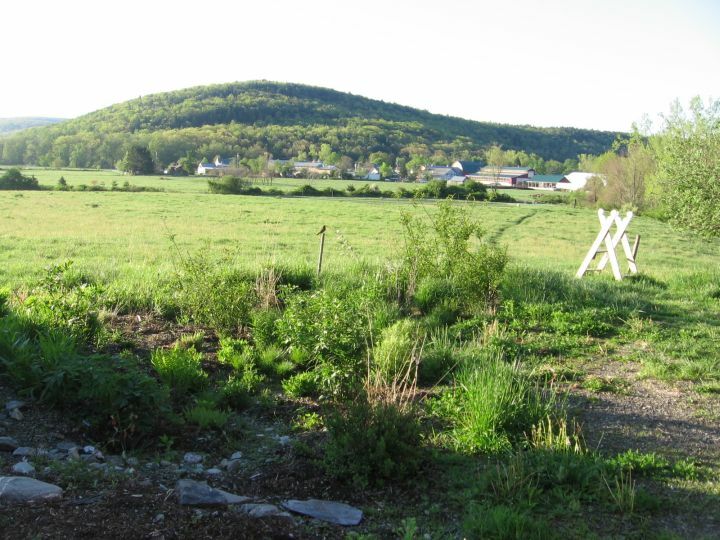 Finally, there are areas currently largely dominated by non-native plants, where we have begun to introduce native plants by transplanting or seeding (e.g., the Orchard Meadow, the Fence Line, and the Seep). If you would like to see pictures from the very beginning of the Creekhouse Garden, please go back to the blog from 21 July 2011. You will see, we try to be relatively strict in our definition of “native”. 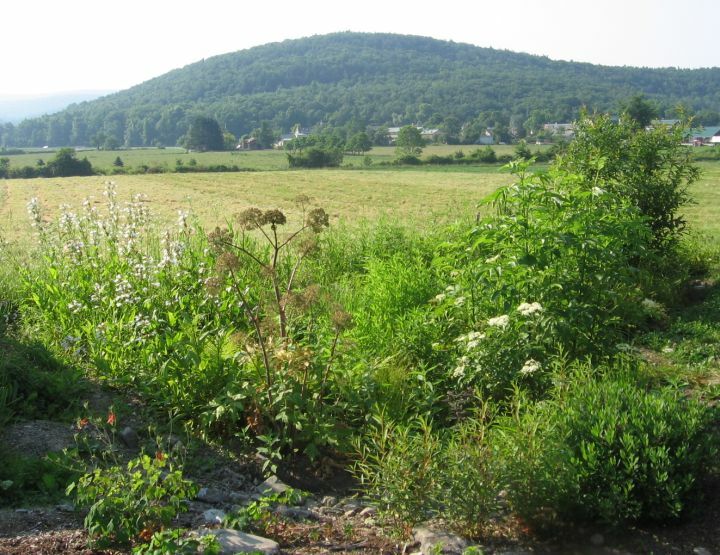 We mostly (although not exclusively) invite plants into the garden that are considered native to NY State and have a long history of growing wild in Columbia County (see “Flora of the Columbia County Area, New York” (McVaugh, 1958) and our draft of an updated plant list for Columbia County). I should also say that we NEVER transplant plants from the wild into the garden. Many of our native plants are not common in the wild and there is always a large risk that a transplant does not survive. 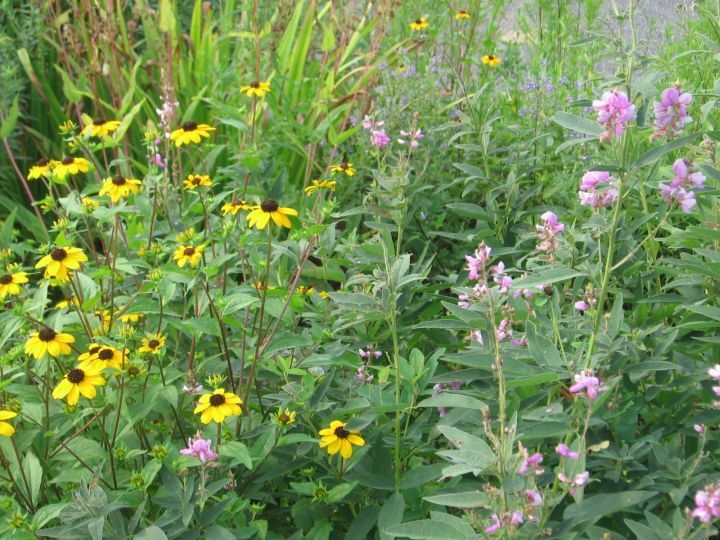 Native plant gardens should supplement, not diminish the wild populations! We do collect seeds from wild-growing plants and try to grow our own seedlings (which has worked really well with some species and not at all with others…) and we accept transplants from gardens of other native plant enthusiasts. The Brown-eyed Susan (Rudbeckia triloba) which brings a lot of yellow to the Roadside Garden had been lingering among the “weeds” in the original overgrown garden bed and was one of the few species we did not smother with newspaper. These plants have thanked us with a spectacular come-back and we are happy to have their cheerful color, although nobody knows for sure whether they should be considered truly native to the County. 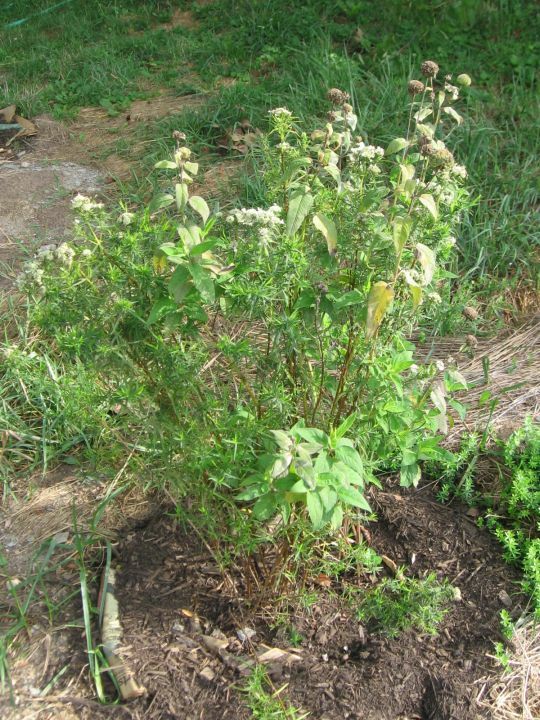 The tall pink-flowered Joe-Pye-Weed (Eupatorium maculatum) has been planted from a potted plant purchased from Project Native two years ago. The orange Turk’s-Cap Lilies (Lilium superbum) are strictly native only to Long Island and a set of counties along the southern border of NY State. But they were given to us by our neighbor John Piwowarski and we love to have them! Further along the road, the Brown-Eyed Susans are joined by the purple Showy Tick-trefoil (Desmodium canadense) which we grew from seeds collected two years ago from the bank of Route 22, just south of its junction with Route 5 in Austerlitz (this is so far the only wild patch of this species we know). The blue mist in the background are the flowers of Downy Skullcap (Scutellaria incana), a species so rare that it is listed as endangered in NY State. 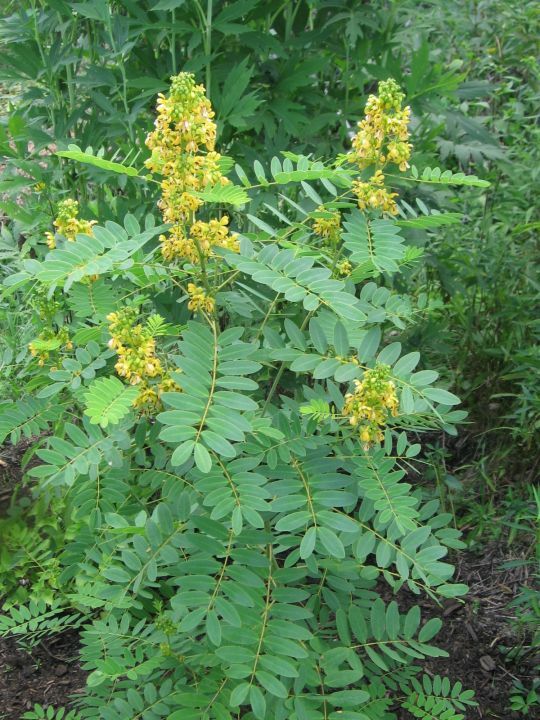 It has not yet been found in Columbia County and the plants in our garden were propagated by Project Native. 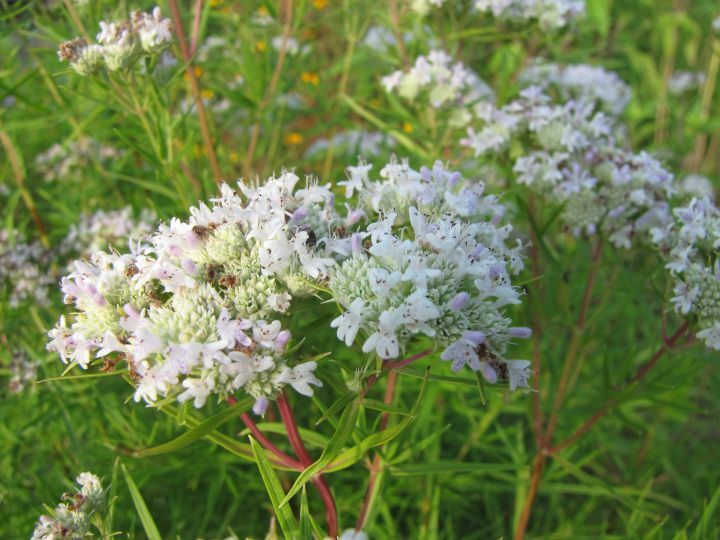 A few plants of Slender Mountain Mint (Pycnanthemum tenuifolium) are still in full bloom in the Roadside Garden. The closeup image below reveals the delicate shape and coloration of each of the tiny individual flowers. 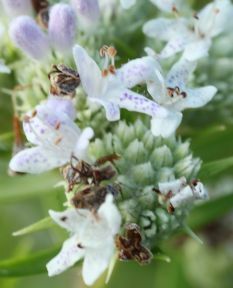 These Mountain Mints were transplanted from another garden, but we do find this species regularly thriving in old fields, often together with Bee Balm (Monarda fistulosa). 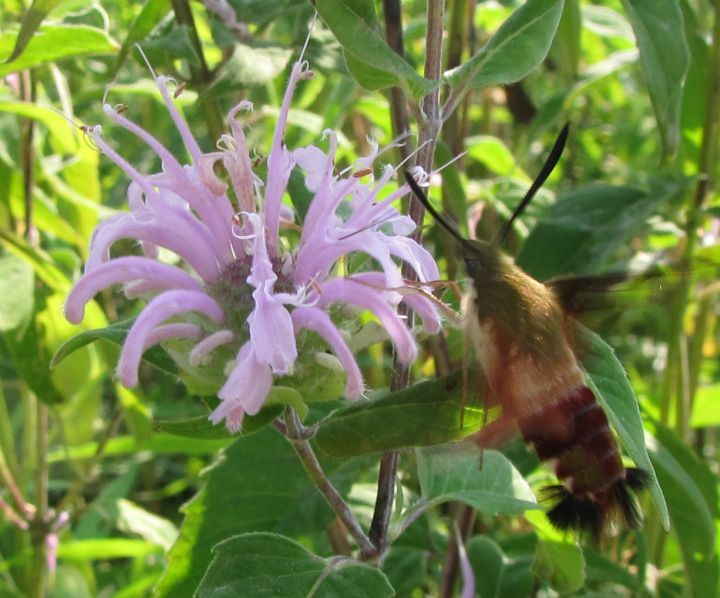 … such as this Hummingbird Clearwing Moth (probably Hemaris thysbe). Here and there, throughout the Roadside Garden, one can find clumps of native grasses, such as Little Bluestem (Schizachyrium scoparium), Big Bluestem (Andropogon gerardii), and Purpletop (Tridens flavus). 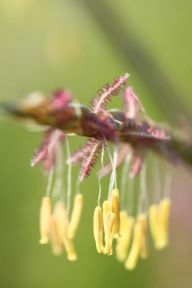 Closeup of the dangling stamens (yellow) and the feathery stigmas (deep purple) of Big Bluestem. Who said that grasses don’t have flowers? They might not have showy petals, but everything else that is needed to produce seeds is there! 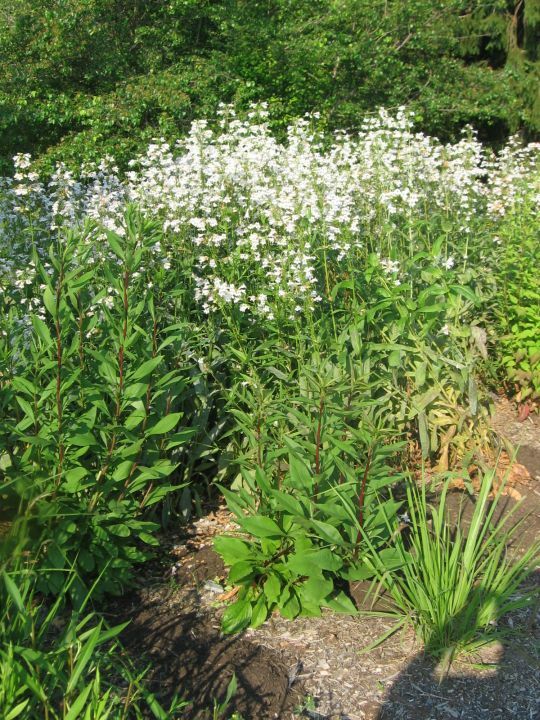 Earlier in the summer, the Roadside Garden was dominated by a big patch of white flowers from Beardtongue (Penstemon digitalis). Several of these plants were barely “hanging in there” amongst the non-native grasses and weeds along the roadside when we first began to shape the garden. We have saved and transplanted several of them and they have recovered spectacularly! In the foreground, you see two Showy Goldenrod (Solidago speciosa) plants with their broad leaves and reddish stems. This is a rare species of goldenrod which does not spread as aggressively as the common Canada Goldenrod (Solidago altissima). The clump of grass on the right is Purpletop (Tridens flavus), a warm-season grass that is slow getting started in the spring but produces beautifully delicate purplish inflorescenses in late summer. This grass was grown from seed collected from a road-side population by our landscaper friend Wendy Carroll. 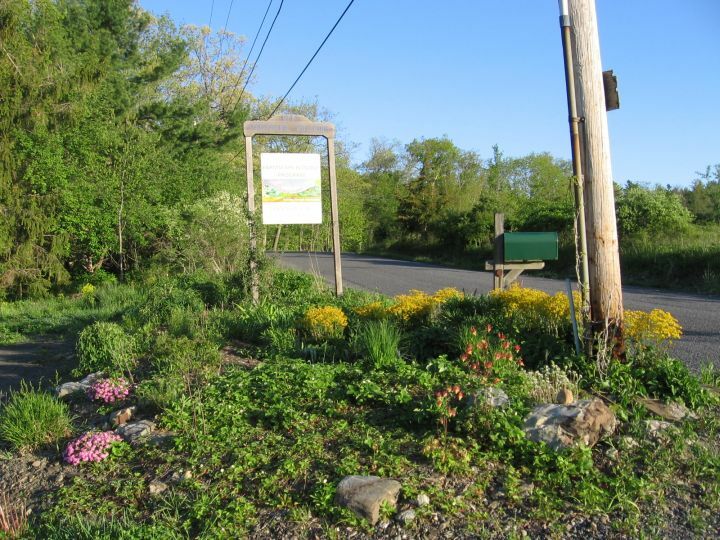 Finally, a spring image of the Roadside Garden… Much of the ground cover is provided by Wild Strawberries (Fragaria virginiana), which we transplanted here from other parts of the Creekhouse garden. The yellow flowers are Golden Ragwort (Senecio aureus), transplanted here from another garden down the road. In nature, this species occurs only in wetlands. The pink patches are Carolina Pink (Silene caroliniana), propagated by Project Native. This species is listed as rare in NY State and we have seen it in only a few places in the high Taconics and along a roadside in Copake. Also present in the Roadside Garden (as in many other places in our garden) are Columbine (Aquilegia canadensis), transplanted here from a forgotten corner behind the Farmstore. 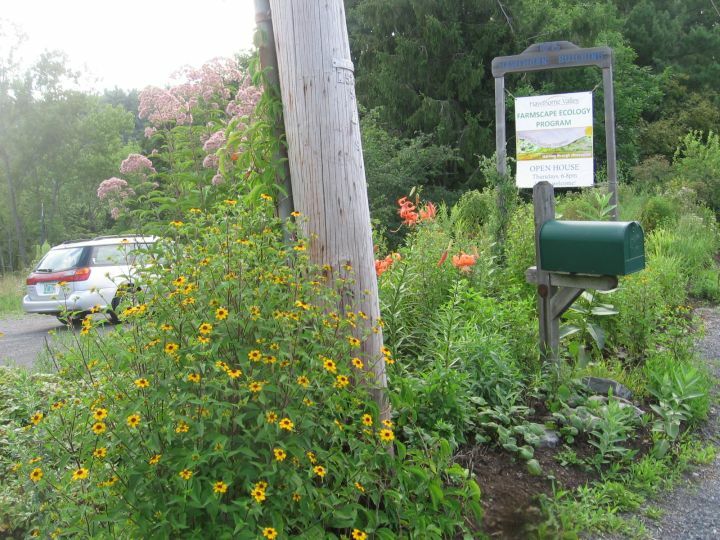 Let’s switch our focus to the Rain Garden, which was designed to catch at least some of the runoff from the parking area in front of the Creekhouse and to create an interesting habitat full of seasonal color changes and rich in insect and bird life near the main entrance. 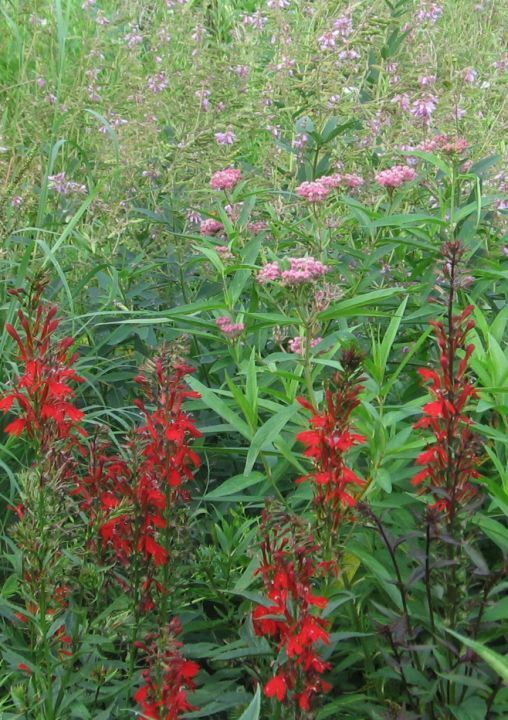 This lovely trio of shades of red are Cardinal Flowers (Lobelia cardinalis), Swamp Milkweed (Asclepias incana), and Showy Ticktrefoil (Desmodium canadense). All three were grown from seeds collected in the wild and raised in pots in our “nursery” below the porch of the Creekhouse. Hummingbirds have been frequent visitors to the Cardinal Flowers and Monarchs and other butterflies can’t get enough of the Milkweed nectar. 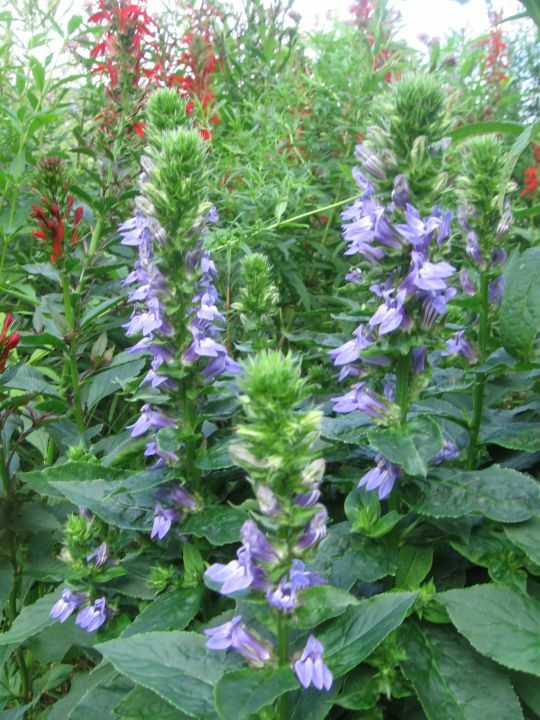 Great Blue Lobelia (Lobelia siphilitica) is a botanical cousin of Cardinal Flower and known in Columbia County only from a handful of calcareous wetlands. These plants were transplanted from the garden of David Lewis and Ellen Winner in Hillsdale. 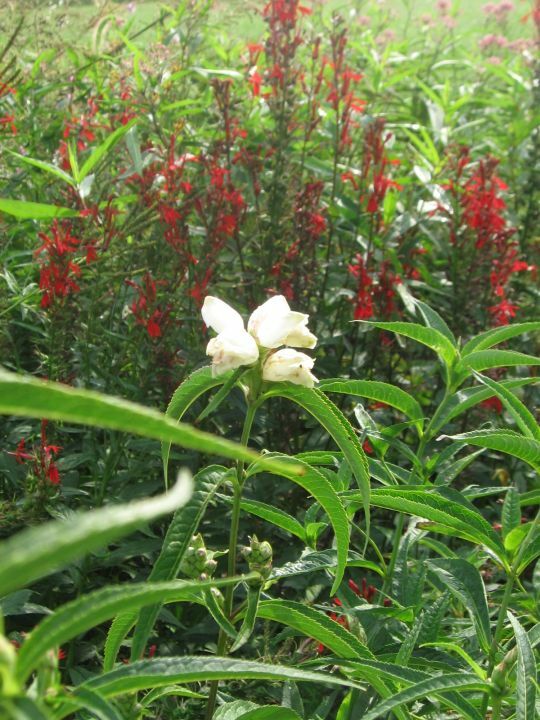 The bold white Turtlehead (Chelone glabra) is found in many wet meadows and swamps. These plants all grew from a single potted plant propagated by Project Native. We are yet waiting for a Baltimore Checkerspot butterfly to discover these plants to lay its eggs on and raise its caterpillars. 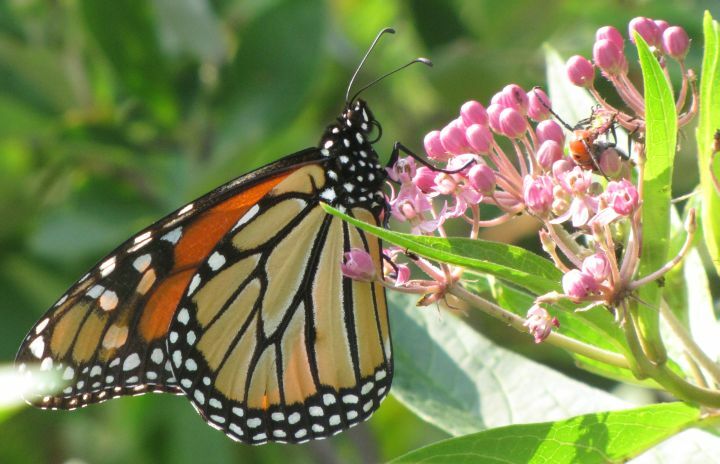 A Viceroy butterfly had discovered the willow shrub in the Raingarden and a “bird poop” caterpillar typical for this species was feeding for a few days on its leaves. Unfortunately, when we finally got around to taking its picture, it had disappeared. 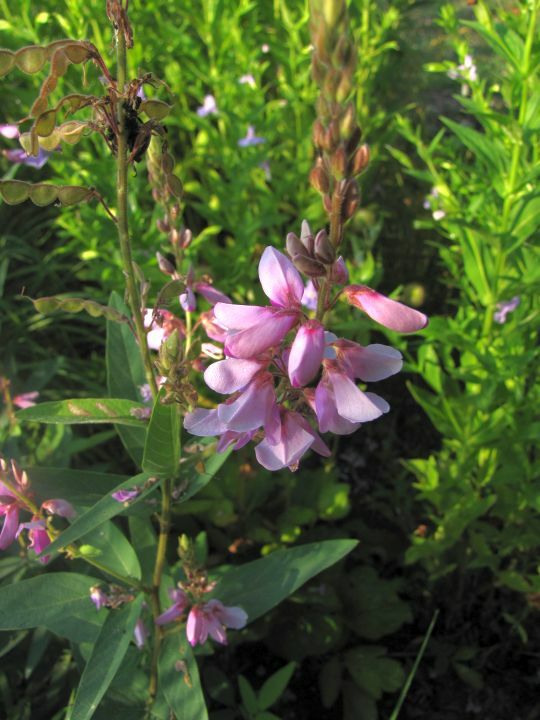 A little known plant worthy of more attention by native plant gardeners defines one border of the Rain Garden. 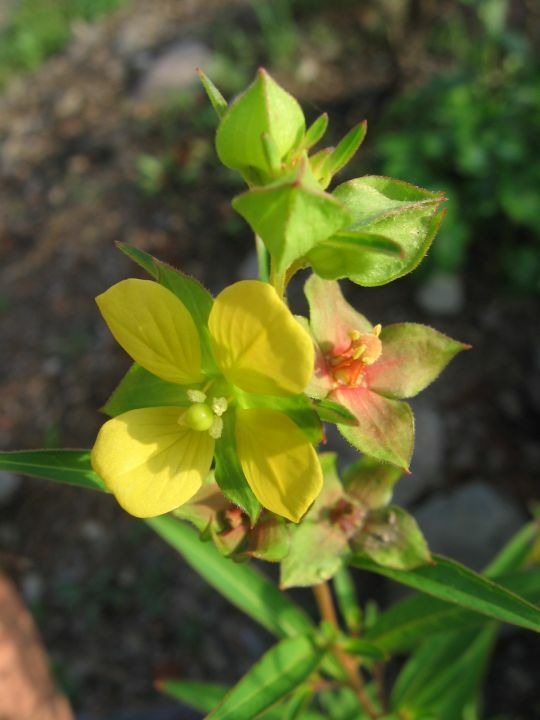 In another month, the foliage of Seedbox (Ludwigia alternifolia) will turn a deep dark red and the red fruits remain on the plant into the winter. This is another species that we rarely see in the wild, but which readily reproduced in our “nursery” from seeds collected on a pasture right here at Hawthorne Valley Farm. Finally, one of the shrubs in the Rain Garden is Bottonbush (Cephalanthus occidentalis). Sadly, it is a bit slow in leaving out in the spring and its lovely white flower balls last only for about a week. However, while in bloom, the flowers attract a multitude of insects, such as this flower fly (possibly Temnostoma vespiforme). 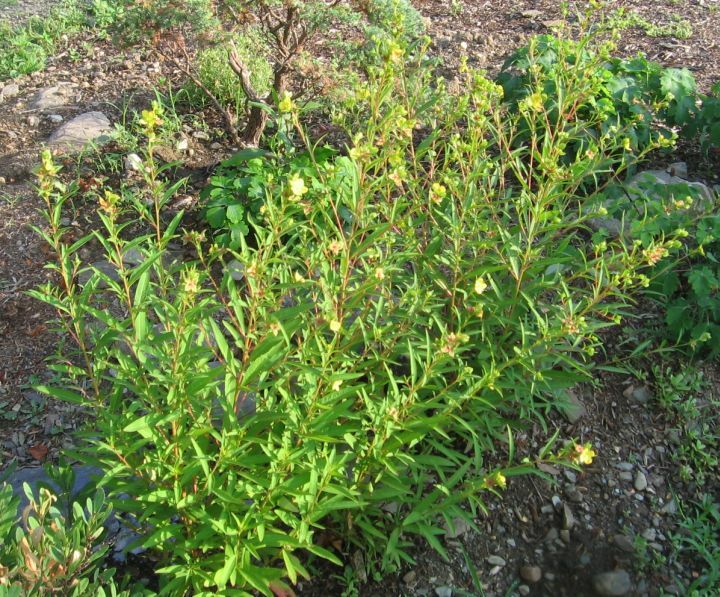 This shrub occurs in the wild in a variety of wetland habitats and is often the dominant shrub in so-called kettle-shrub-ponds. These ponds now fill depressions that were formed by chunks of ice left behind by a retreating glacier. Back in June, the Rain Garden was dominated by the white flowers of Beardstongue (Penstemon digitalis), transplanted here from the Roadside Garden, and the white flower clusters of Elderberry (Sambucus nigra var. canadensis). The showy flower stalks of early-blooming Angelica (Angelica purpurea) are also visible in the foreground. The Shade Garden is slowly taking shape under the big Honey Locust tree south of the Creekhouse. 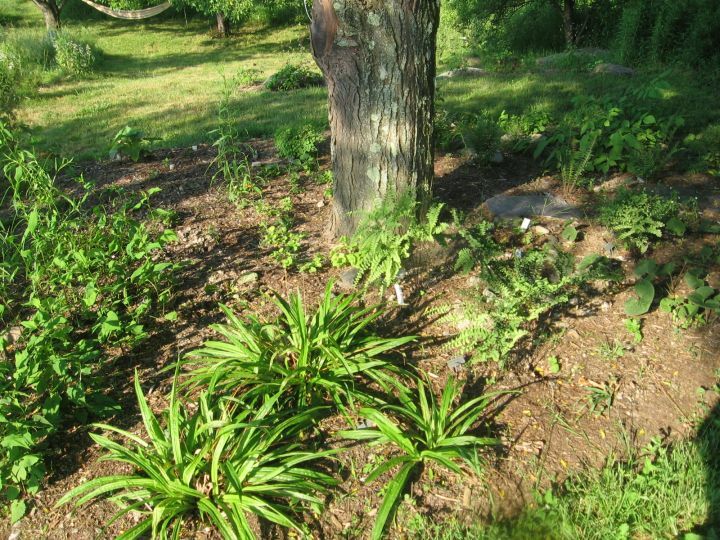 Here, we have invited a variety of woodland ferns, sedges, grasses, spring ephemerals, as well as shade-loving asters and goldenrods. Work on this garden bed only began a year ago and it still has a “young” feel to it. Most of the asters and goldenrods grown from seeds collected last fall are not yet going to flower this year. 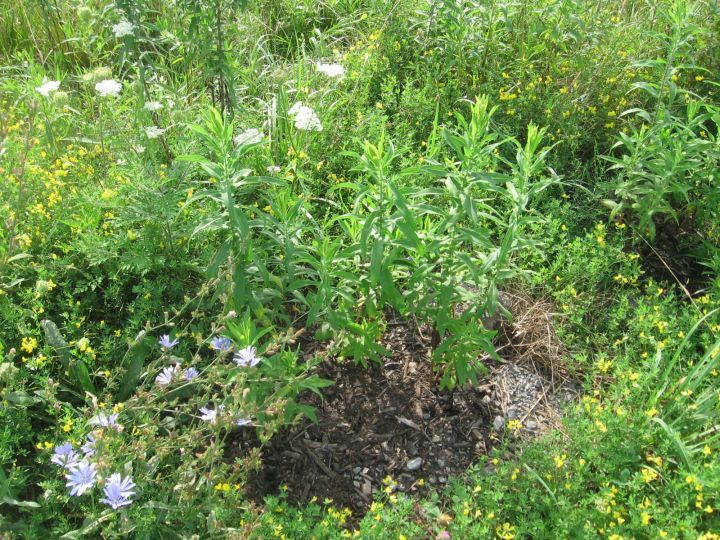 Along the “weedy” fenceline between the parking lot and the pasture, we began to enrich the vegetation with New England Aster (Aster novae-angliae) seedlings grown from seeds collected along Harlemville Road last fall. The seedlings will be protected from competition by a layer of mulch for a couple of years and then they’ll be on their own to hold their place… We are eagerly waiting to see if any of the seedlings are strong enough to produce flowers this year. 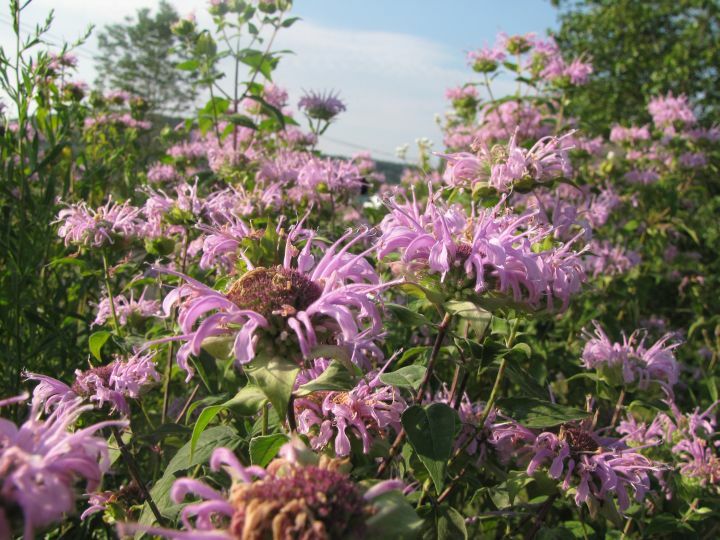 In the meadow (former lawn) below the fruit trees, we also began to transplant New England Aster seedlings, as well as established Beebalm, Mountain Mint, and Beardstongue from the Roadside Garden. If you would like to see pictures from the very beginning of the Creekhouse Garden, please check the blog from 21 July 2011. I also would like to extend an invitation to all of you to come visit the garden in person. Thursdays 6-8pm is a great time, because we are always here for open house. If you are hoping to come some other time, please give us a call to make sure, somebody will be here to show you around. You are also welcome to just stop by and look around on your own! The Creekhouse is located at 1075 Harlemville Road in Ghent. Our phone is (518) 672-7994. Finally a great big THANK YOU: Many people have contributed with their expertise, with plants and seeds, and with muscle power to the conception and realization of the Creekhouse Garden. Foremost I would like to thank Ruth Dufault and her crew, who really got us started. We also received valuable advise from Judy Sullivan (formerly Project Native), Linda Horn, Tina VanDeWater, and numerous other native plant gardeners and landscapers. Additional hands-on help came from the garden crew here at Hawthorne Valley, the FEP summer interns and several volunteers. I would like to particularly thank Anna Fialkoff for her enthusiastic help and expertise with the native plants and Ken Kilb for his steady support with weeding, hole-digging, transplanting, and mulching during this year. The garden would be much poorer if it hadn’t been for these two wonderful people!